This book will aim to provide relevant theoretical frameworks and the latest empirical research findings in the area of marketing activity of companies, different institutions and organizations, new trends on global market, as well as contemporary customers behaviour. It will be written by and for professionals who want to improve the general understanding of problems with different aspects of modern marketing and ways of building relationship between companies and customers. The book as itself has been the product of network of academic researchers created around the Dukenet network that has benefited from many distributed contributions. The entire publication is divided into four parts. First part provides an introduction to the topic and focus on the new trends in market and marketing. Part two presents selected aspects of contemporary marketing communication, particularly integrated marketing communication models and strategies of branding of companies and institutions on different markets. Part three is dedicated to customers and their behaviours on contemporary market. There presented problems with consumptions as well new trends in consumption behaviour, including sharing and common consumption. 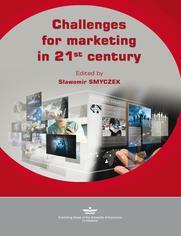 The fourth part, which conclude this book, discusses range of papers dedicated to different issues related to education of marketing, including new approaches for teaching and evaluation, as well difficulties of students concerning the choice of the education institutions, career planning, entering the labour market and starting their own marketing career.